Jackfruit is the “It” ingredient of the plant-based and vegan cooking world. When I started blogging about my plant-based cooking exploration and experimentation, jackfruit was one of those exotic ingredients that I could only get in a local Asian grocery store. My first jackfruit recipe were the tacos, which still make a frequent appearance at the dinner table because they take no time to make and are really, really good. But what I discovered soon after is that jackfruit is a lovely and realistic stand in for seafood, and you can make a fabulous crab-free crab cakes and clam-free New England clam chowder. I’ve also used jackfruit to make a very rich chickenless tikka masala – yummy! So in order to feed this new hunger for jackfruit I would go to the Asian grocery store and buy a pile of canned green jackfruit in brine. But, two weeks ago I found out that Trader Joe’s now carries jackfruit suggesting that this amazing plant has gone mainstream. I still bought more than I need just in case and immediately jumped on testing it out. What I did with two cans of young (green) jackfruit in brine this time around is transform it into a mellow slow cooker (crockpot) stew infused with onions, garlic, Indian bay leaf, dry basil and ground cumin, as well as spiced up with a bit of red and green chili pepper. In case you are wondering about the Indian bay leaf, the tree it comes from belongs to the same family as the cinnamon tree so the flavor is a bit of a mix between bay leaf and cinnamon. So, if you don’t have Indian bay leaf on hand, you can simply use some regular bay leaf and a dash of cinnamon. What I like to do when using canned vegetables is to dump the contents of the can out into a strainer and rinse well with lots of water. Then I let access water drain out for few minutes before using. 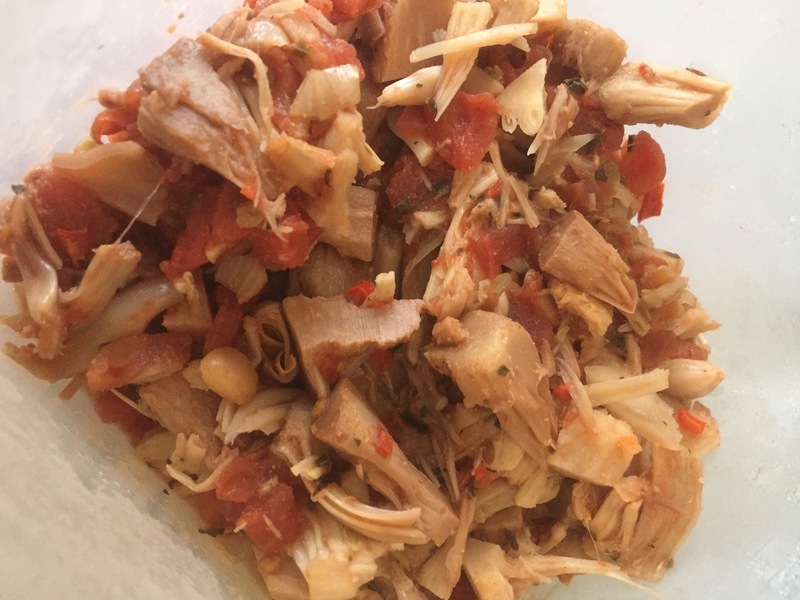 In the case of jackfruit I also prefer to pull the bits of fruit apart, so what I end up with is a pile of pulled jackfruit ready to be flavored in any way I like. 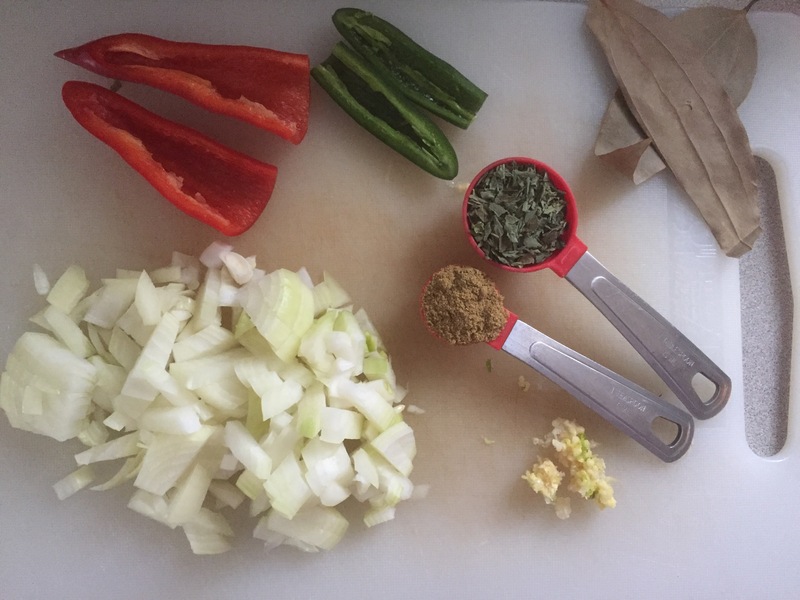 My favorite slow cooker trick that I mentioned before, but is definitely worth repeating, is to combine the aromatics (onion, garlic, chili peppers, and spices), add some oil or cooking spray, and soften in the microwave for three to five minutes. This helps them develop some caramelization and flavors that slow cooker is not able to achieve. Finally, these days I don’t use the slow cooker unless lined up with crockpot liners that make the cleanup an absolute breeze. 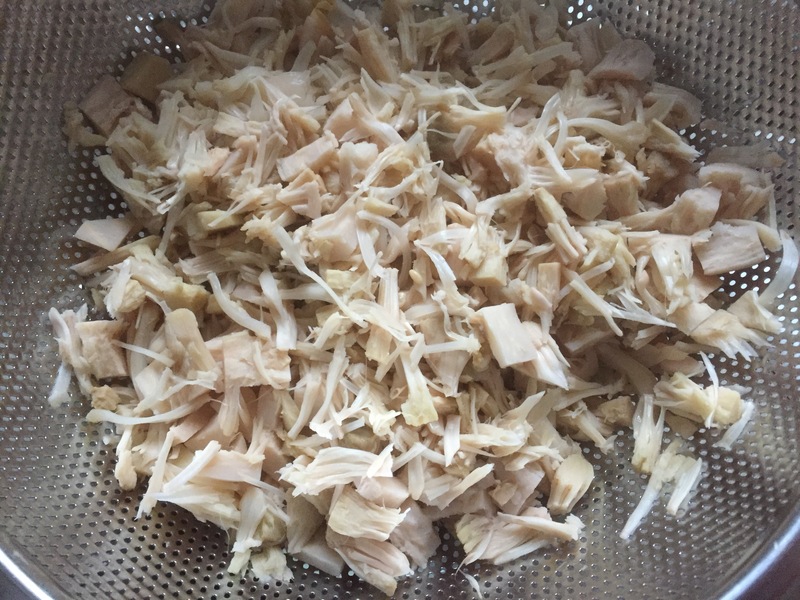 Rinse and drain the jackfruit to clean out access brine. Pull the jackfruit pieces apart, removing any hard bits of core and seeds that may have been present (I leave softer bits of core and seeds in). Place the jackfruit in the crockpot that’s been lined with a liner. Remove the seeds and the veins from the chili peppers and diced them finely. Dice the onions and crush the garlic. Mix chili peppers, onion, garlic, dry basil, and ground cumin in a microwave safe bowl with the vegetable oil until everything is well coated. Microwave for 3-5 minutes. 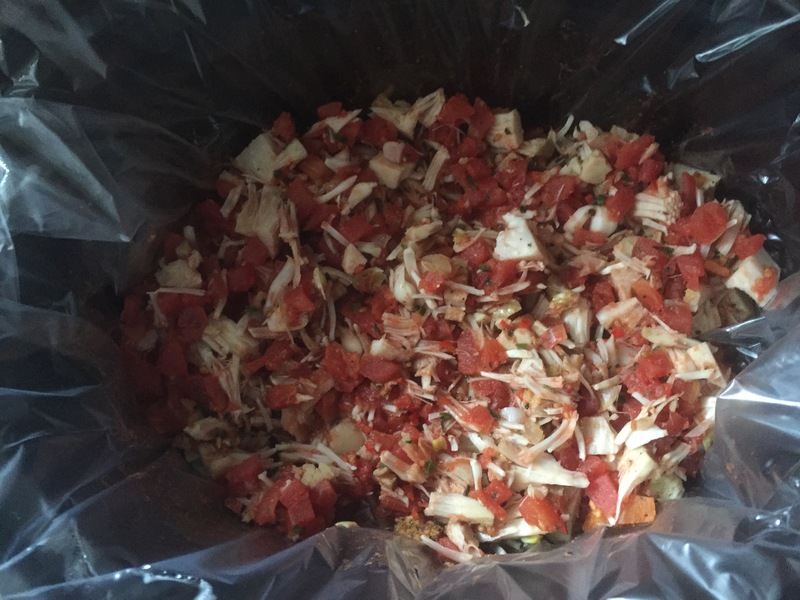 Add the aromatics to the crockpot as well as petit diced tomatoes and mix everything together. Serve over basmati rice, or even pasta. This stew is fragrant and just discretely spicy. You can definitely adjust the level of spiciness to fit your palate.